Frequenting a gym can be a life changing experience. Whether you want to shed a few pounds or gain some muscle, when used in conjunction with a good diet the gym is the gift the world has given to help fit-goals reach new heights. If you’re a student at Mount Royal University (MRU), you’ve already been endowed this gift. But before taking the initiative to set foot in the gym you first need to know what to bring. 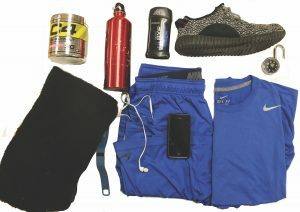 So, what should you have in your gym bag? M- My gym big is the classic black and white striped Victoria Secret bag, mainly because I got it for free and it is the Mary Poppins of gym bags – aka it holds a lot of stuff. I typically like to carry around everything but the kitchen sink because for starters it’s basically a workout in itself and I always like to be prepared. Between balancing school, two jobs and trying to live a healthy lifestyle, my schedule is usually packed. With my trusty gym bag, I’m always ready for action. B- Unlike Melanie, I try not to overload my blue Projekt backpack. However, I would never discredit its importance; It is the Viagra of gym bags – aka it helps me get huge. M- In a small toiletry bag I keep the obvious essentials like deodorant and pony tails. These new “telephone-wire” plastic hair elastics are revolutionary, no longer will you be trying to re-do your hair while simultaneously running on the treadmill or going into downward dog during hot yoga. I also have a small towel, some travel size shampoo and conditioner and a bottle of body spray to freshen up after a workout and get me ready to face the world again. In the main compartment I keep my shoes, and a pair or two of socks, and a couple of different clothing options. Depending on the workout I like to wear different things. Usually I balance out my “skin-ratio” and wear shorts like the Nike Pro’s with a longer sleeved shirt or a Lululemon tank with pants. This helps keep me cool but also get a nice sweat on too! For days when I really want to sweat and get a good detox I use my Sweet Sweat band that I ordered off Amazon for about $40. Although it is marketed as a waist trimmer, it is more of a compression band that supports your back and abdominal muscles to help target those muscles and promote more perspiration! B- Also unlike Mel, I don’t keep my gym bag all that organized and I have quantifiably less hair products. Why is this? Mostly because organization has never been a strong suit of mine and I’ve never personally had a problem with my hair on the treadmill (I never touch the treadmill). Instead, when I leave in the morning I make sure to have a lock in the bag to prevent the few and far between robbers of MRU from taking off with my stuff like Jameis Winston took off with those crab legs back at Florida State. I also throw in a body towel, deodorant, and a pair of Adidas running shoes, because when I forget those I’m forced to pump iron in unstable Yeezys, making my squat rack desires futile. Finally I put in a pair of gym shorts and a Nike Dry-Fit shirt. It is important for the shirt to be about a half size too small, making you look bigger. This is especially useful when you’re maxing out on the bench press- seeing the illusion of massiveness will make others think you’re just warming up. But in all seriousness, everyone at the gym only cares about themselves and, unless you’re setting world records, don’t know you exist, so don’t sweat other people’s opinions. Everyone starts somewhere. M- Perhaps the most important item is a good water bottle! According to WebMD you should be drinking close to a full liter of water during a 60 minute workout, so making sure you pack a good water bottle can help you reach your daily goals! The S’Well bottle has become my best workout buddy. The 17oz bottles range from $30 to $40 and although they do have a screw top lid I feel that this makes me really take my time and get a good gulp of H2O down! The best thing about the bottle is that it keeps your cold drinks cold for 24 hours (no ice needed) and your hot drinks warm for 12 hours. My S’well bottle has gotten me through numerous hot yoga classes and help me survived some harsh winters! Instead of bringing my entire makeup bag, I picked up the Naked on the run pallet from Urban Decay cosmetics. It has all the essentials – bronzer, blush, mascara, eyeliner, lipgloss and a couple eye shadows in one portable square pallet and a nice compact mirror. This bag leaves me with no excuse for not squeezing in a workout as I can easily get ready for any event after! And last but not least – headphones. I either listen to tracks on my phone or instead of watching my favourite shows on the couch, I head to the gym and tune in during my cardio sessions. B- I like to start with a good pre-workout mix, which I usually keep in my bag along with a shaker cup for easy mixing. I have C4 (pre-workout powder) in the bag right now and it’s basically watered down speed. This is also a good idea because the cup can be reused after the workout for a protein shake. Sometimes I keep the protein container in my locker or car, but more often than not I’ll fill a ziplock bag with protein mix before I leave the house in the morning. Having a pair of headphones in your bag is an absolute must. Have you ever been forced to train without music after forgetting your headphones? I have. I think I heard the same dumb Meghan Trainor song over the gym intercom at least three times. With headphones you can plug in your phone and listen to whatever gets you pumped up most. For me, hitting play on hard hitting tracks like Drug Dealers Anonymous or any old Jay-Z increases my productivity and allows for the highest opportunities for success and results in the gym. Finally I keep a Fitbit, and sometimes a squash racket in my bag. While I don’t usually wear the Fitbit during gain sessions, when in a competitive “workweek hustle” Fitbit battle with friends the added 10,000 steps from a good game of squash can be just what you need to power yourself to supremacy over your Fit-foes.